Spacieuse villa au sein de très courte distance de marche de la plage. Cap-x-ta-mer est divisée en 2 unités, une villa de 4 chambres à coucher et un appartement de 2 chambres à coucher. La villa se compose de 3 niveaux. Au niveau supérieur: comprend un garage double et supplémentaires de stationnement hors rue. Cela ouvre sur un hall d'entrée avec un escalier qui mène vers le bas dans le salon. Superficie habitable: dispose d'un design moderne avec un écoulement facile entre la salle familiale, salle à manger, le salon, et une piscine intérieure. Le salon a une quantité généreuse de l'espace, et dispose d'une jolie domaine social. La salle à manger donne sur un patio où vous pourrez vous détendre et profiter de la vue sur la baie. Le patio comprend un barbecue. Toutes les chambres et les salles de bains la plupart sont situés sur le 3ème niveau. Les chambres ont été élégamment redécoré, avec l'objectif principal étant sur la relaxation et le confort. Bonne literie de qualité est fourni, serviettes de bain et serviettes de bain sont inclus. Sèche-cheveux ainsi que dans toutes les chambres. L'appartement de 2 chambres est une unité autonome en dessous de la villa et a une entrée séparée côté. Il est confortablement meublé et offre les mêmes vues spectaculaires que la villa. Il y a un parking baie au large de la rue disponible pour l'unité. Il ya des serviettes de toilette fournis. The view of this house only is worth it. We all loved waking up to the bright winter sun over the water. It was the greatest selling point for us and it was more beautiful in person than the pictures. We spent over a week in the house. We were six people with two kids, husband and wife, grandma and Aunt. We utilized all four bedrooms- the kids got the side view, grandma and Aunt each their own room, and my husband and I the master. The upstairs bathroom had a shower, but we only used it for the toilet as all our items were downstairs. The house actually has three stories, stairs from the garage to the main living area and pool, then another set of stairs for the bedrooms. There is another apartment one floor down as well, but we did not rent out that section (it was also not rented while we were there). For the stairs, I would not recommend it for very young children or those with difficulty on stairs. For us this was not an issue. The house itself was gorgeous and it being winter a little cold when we arrived late at night, but the heaters in the rooms warmed up everything nicely. The special pellets for the upstairs heater (extra cost) also did a great job of warming up the upstairs. We had a lot of space and three rooms in suite which meant privacy for all of us, which we all enjoyed. I was able to communicate quickly via email (using the houses wifi) for any questions or issues that arose. We didn’t have any major issues, and the included booklet about the house and how to use items were helpful. We cooked some in the house and spent a lot of time relaxing over a bottle of wine on the balcony. My kids loved playing pool and in the indoor pool- though it was not heated and freezing. Cape Town is experiencing a drought so measures are in place to assist such as buckets in showers to collect water to flush toilets and baths tubs have no stoppers to discourage their use. Water for the pool has to be trucked in. They are starting to get water again so some of these water saving tips may diminish soon, but keep this in mind if you plan on traveling to the area soon, as this House is not the only residence experiencing these issues. There was a it if information on how we could help save water. Overall we loved the house and we would return to this house again if we were in the area. Tack för din feedback och vi är glada att du haft din vistelse. Thank you for choosing Cape-x-ta-sea, we are happy you had a good holiday. We appreciate your feedback. As an Australian family travelling to see Capetown, we were so lucky to find this amazing home. 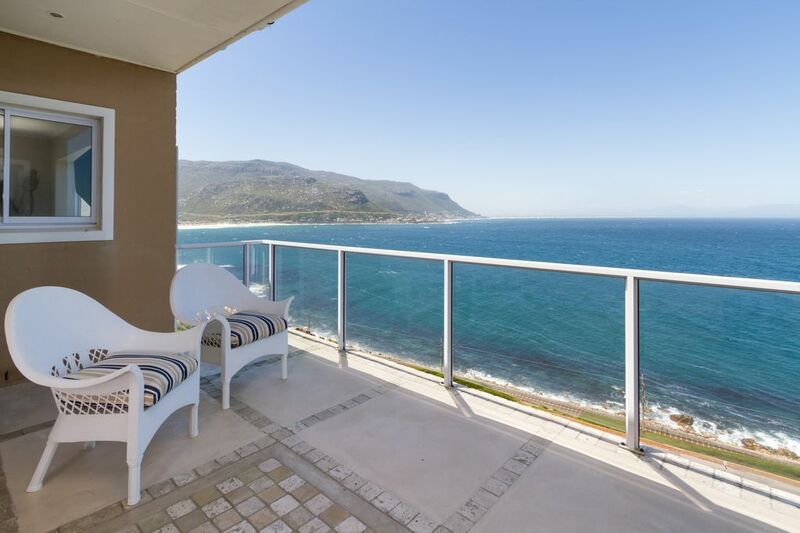 Set-up high with commanding views of the sea and opposite coast line visible all the time from the living spaces and bedrooms. Yet, you are so close to the water that with the balcony doors slid back the intoxicating sounds of the sea become part of every moment of the day and evening. Just terrific. The house is solid, kid friendly and no-fuss with lots of light. Quiet bedrooms are separated downstairs from the living area. The main living space is all on one floor with a choice of spaces for family members to have their own quiet time. when friends arrive the space opens out to the private pool and BBQ area creating a perfect entertaining area with pool and view. We had 4 terrific weeks here in what was a brilliant, memorable holiday. It couldn't have been better and we would return anytime in a heartbeat - summer or winter. We are really thankful when our guests take the time to comment on our holiday home and certainly from your eloquent review, you were able to appreciate all that Cape-x-ta-sea has to offer, which is very pleasing for us. The house has an amazing living area for entertainment, but as you pointed out the bedrooms are on a separate floor and are very quiet & private. Yes the views are marvellous and it's such a privilege being able to appreciate them from every room. We are delighted your stay was memorable and we look forward to your next visit. Incredible location and very comfortable! What a great place to accommodate a large family. The rooms are spacious and comfortable. The living areas are large and open-plan. But the most impressive aspect is the view. From almost every window you can see the sea. Incredible! Management and cleaning staff are efficient and friendly. Don't look further than this property - you won't regret it! It's wonderful to read your lovely comments and we are happy your stay with your family was enjoyable. You are correct, it is a villa that is easily able to accommodate large family gatherings, with ample space to relax & enjoy. We wish you all the best and hope to see you again soon. Contact the house manager regarding any further information & rates for the flat.